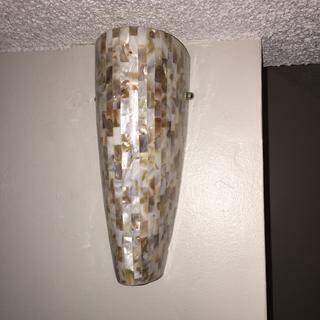 Accent a home with the light and natural beauty of this mother-of-pearl mosaic wall sconce. 11 3/4" high x 5" wide. Extends 4 1/2" from the wall. 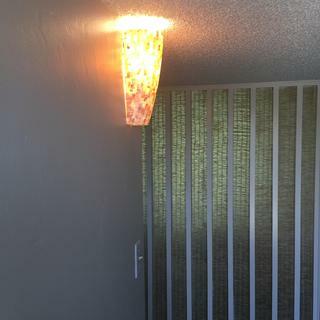 Mosaic wall sconce from the Possini Euro Design® lighting collection. Mother of pearl tiles on glass. Brushed steel finish accents. Can be installed to focus the light up or down. Hoping this will help blend modern &antiques! Re-modeled our 1/2 bath and looks like this will look great. Can this sconce be hardwired? BEST ANSWER: Yes you can whitout problem. All wires all incluses. Yes. Turned on/off by a wall switch. 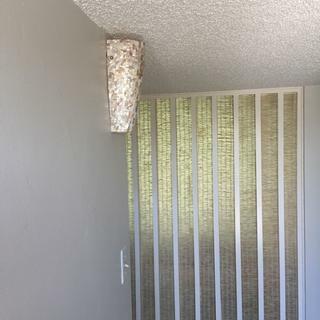 What are the colors in the sconce? Thought it looked like gray in the picture but hoping the colors are more neutral like beige & light tan/taupe. BEST ANSWER: Not gray, definitely tan/beige/taupe with some pearly pinkish tones. Love these sconces, purchased for a home flip but would put some in my own house if I had sconces. Nice warm organic accent. I purchased two of these and they are a nice ivory and tan iridescent combination. You will not be disappointed. Thank you Coleen, looks like I'll also be buying two of them. The colors are more neutral, like you described - light tan, taupe, beige, white. What is the cost of shipping to Hawaii, zip code 96738? BEST ANSWER: Hi, to obtain a shipping quote please contact one of our lighting specialists. How easy is it to change the bulbs, from the top? Or is the sconce come off first ? BEST ANSWER: It's very easy to install and change the bulb. No need to remove the sconce to change the bulb. It's an elegant sconce. We love it. Very easy, just reach down from the top side. No disassembling necessary. Just do from top, don’t need to take off the sconce. Easy to change the bulb from the top. Can these be mounted upside down to focus the light downwards? BEST ANSWER: hi Tim - Yes, it can be mounted upside down to focus the light downwards. However, please note that this sconce does not come with a diffuser. Seems pretty solid. I would think so however I actually haven't tried. BEST ANSWER: Unfortunately, we do not offer this collection in a larger size. does the sconce have a on/off switch or is it wired to a wall mounted switch? BEST ANSWER: These sconces are mounted on the wall to a standard light junction box. I was able to mount them in a corner, but had to build wooden standoffs myself to do so. I am still confused. Is there an on/off switch on the light itself? Hi - this is a hardwired design, it does not have an on-off switch on the light itself, it is operated by a wall switch. Is this battery operated or direct wire? I am using this in a stairwell. Beautiful sconce as mentioned by all who see it. Drawback is that in a stairwell you need three of them. Even with a 75 watt eco friendly bulb the illumination is less than I would like. I think if I had installed three of them in a diagonal down the stairwell wall, I would have been awesome and plenty of light. But am happy with it as is for most part and do not want to spend the additional amount for electrical install. This sconce is gorgeous. I shopped around quite a bit before buying it and actually saw something similar for more than 3 times the price. It's an amazing value and a very elegant look. Delivery is prompt, and the packaging ensures that these fragile items are not damaged in transit! These sconces looked a little cheap with the plastic feel, but ended up looking beautiful on my wall going up the staircase. The glow of the light really brought out the colors and beauty of the light fixture. 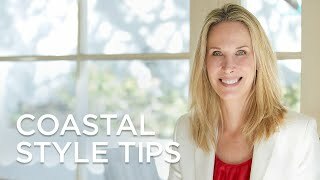 I recently bought a new house and in the master bedroom removed two lights that were not my style. I found these lights and couldn't be more pleased. They are absolutely beautiful and the contemporary look I wanted. I love the design . Great Wall accent!! I would recommend this sconce. Easy to install. Beautiful wall fixture!! Absolutely LOVE the two sconces!! Absolutely love the two sconces. They were well made and much prettier than the picture. Great price but very expensive looking. We love the color the Sconce presents when we turn on the light in our 2 bedrooms. Very warm & inviting. We were looking for sconces for the bedroom, to replace the bedside lamps. My husband put these in with a dimmer switch. The light is very warm. They’re perfect! Elegant sconce. Very happy how it looks in our small hallway. This is a very easy to install sconce which is very well made. It brightened our small hallway. Very pleased with the purchase.